Chelsea manager Maurizio Sarri said he will give coach Marco Ianni "another opportunity" after he was charged with improper conduct during the 2-2 draw with Manchester United. Ianni celebrated Chelsea's 96th-minute equaliser in front of the United bench, sparking a retaliation from manager Jose Mourinho. 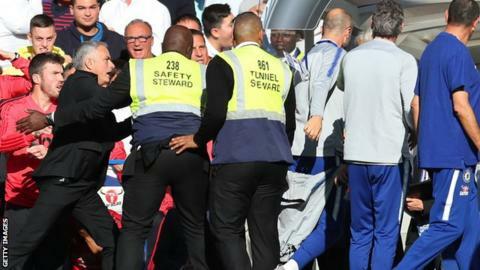 Mourinho was not punished by the Football Association for his part. "I know very well that he was really sorry," said Sarri. "And so I think that I want to give him another opportunity, because I know very well the man," he added. "I don't know the consequences, but we were wrong so we have to accept the consequences." Asked what punishment Chelsea would impose internally, Sarri added: "I don't know. I want to respect the decision of the FA and then we will decide." Manchester United boss Mourinho was "formally reminded of his responsibilities" by the FA. "I want to thank Chelsea and [Sarri]," Mourinho said. "The young boy does not deserve more than what he got. He apologised to me. He deserves a second chance - he doesn't deserve to be sacked. "He went through a situation where he recognises he was wrong. I hope everybody does the same as I did and do not disturb the career of a great guy. Probably someone with great potential. I'm not happy at all with more than that."